4-Word Review: Running for his life. 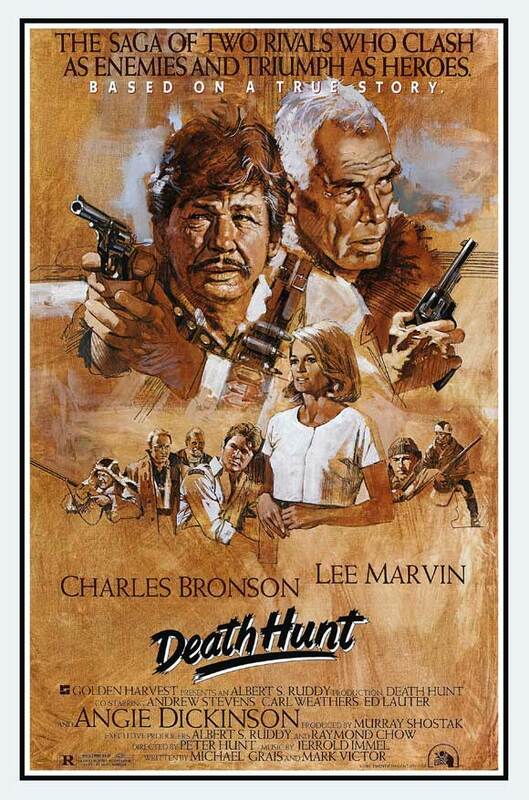 Last year during January we reviewed films Charles Bronson did during the 70’s, so this year we will look at some of the ones he did in the 80’s. This one is based on the true story of Albert Johnson who was a fugitive that sparked one of the largest manhunts in Canadian history. Bronson plays Johnson a loner who lives by himself in an isolated cabin situated in the corner regions of the Northwest Territories and Yukon. He comes upon a vicious dog fight that has been orchestrated by some of the local men. Feeling sorry for the bloodied animal he tells the dog’s owner Hazel (Ed Lauter) that he will buy the animal, but Hazel refuses and Johnson ends up giving him he money and taking the animal anyways. Outraged Hazel goes to the local sheriff Millen (Lee Marvin) telling him that Johnson ‘stole’ his animal, but Millen knowing that Hazel was part of an illegal dogfight does nothing about it, so Hazel gets some men together to form a posse. A shootout ensues at Johnson’s cabin and when one of the men gets killed a reluctant Millen is forced to go after Johnson who goes on the run in the frozen, snow covered rugged mountains. The film is an exciting high-grade adventure from the very start. The tension mounts perfectly and Jerrold Immel’s pounding orchestral score keeps the pace going. Director Peter Hunt mounts some great action sequences including the shootout and standoff at the cabin and also a heart-stopping moment where Johnson jumps off a steep cliff and onto a tall pine tree. The character’s ragged personalities perfectly reflect the raw climate and the internal bickering that goes on amongst the men as the chase Johnson creates an interesting subtext. The film was shot in Northern Alberta, which is good because it gives the viewer a taste of the cold climate. The aerial footage of the mountainous landscape shown over the opening credits is breathtaking. However, it was clearly not filmed in the dead-of-winter as the sun was too high in the sky and although there was snow it was obviously thawing thus making the moments were the men complain about the bitter cold not ring quite as true. Marvin is excellent and pretty much takes over the film. He looks older and tired here, but it works with the character that seems to be coasting and uninterested in getting involved with anything. Having both the main characters likable and relatable makes the chase more captivating and psychological complex from both ends. Bronson is good in a role that takes advantage of his stoic nature although he only gets shown intermittently and it is Marvin who gets the most screen time and the best lines. I liked the character’s relentless will to survive and ability to adapt to the circumstances, but I wanted some explanation for how he was able to survive inside his cabin when it gets exploded with dynamite, but unfortunately one never comes. Angie Dickinson who was 50 at the time and looked to have had a facelift and some work around her eyes is wasted in a completely pointless and forgettable part. Andrew Stevens who has proved effective in bad-guy roles plays a very clean-cut, rule-oriented Mountie here and does okay. Durable character actor Henry Beckman has a great small role as a shifty trapper who sits-in-the-shadows only to come out and get involved at the most surprising moments. The film takes a lot of liberties with the true-life incident and was highly criticized at the time for being too ‘Hollywoodnized’, but it succeeds at being entertaining although I thought it would have been appropriate to have some denouncement at the end.